Among the other bale wrapping products available, a bale wrap is the most durable one. It’s made of the highest quality materials. It ensures maximum storage protection from the outdoor elements, especially when you’re storing it outside. 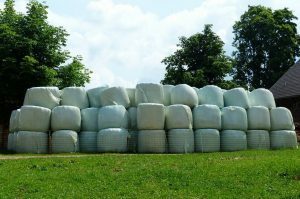 By providing that your bales are well-protected, a bale wrap can guarantee the freshness of your bales once the time comes for them to turn into animal feed. That’s why if you’re looking for the best protection that can create the best-quality animal feed, you should always go for a bale wrap. A bale wrap that guarantees maximum protection can automatically produce the best quality fodder. When it comes to animal feed, we need to make sure that it’s made from the highest quality possible. It needs to pack in the nutrients and vitamins required for our livestock animals to grow and be profitable. That’s why when it comes to storing your bales, you should choose a bale wrap to ensure that your bale locks in the freshness and nutrients that it naturally has. That way, you will always produce high-quality fodder that you can either sell or use for your farm animals. Finally, the high standard fibrous materials that are used to make your bale wrap makes it sure that you will have lower spoilage rate compared to using other bale wrapping products. A bale wrap is coated in a superior non-toxic substance that help makes it stronger and ensures that no quality-altering foreign bodies will enter your stored bale as it’s developing into fodder. That way, you will get the best results without any waste. Order A Bale Wrap Now! Bale wraps are lifesavers for agriculturists and farmers alike. It saves them time and guarantees high profit for their bales and farm animals due to their fantastic storage capabilities. If you’re not using bale wrap, it’s about time you make the switch. So, go ahead and order a bale wrap now and experience all its benefits.